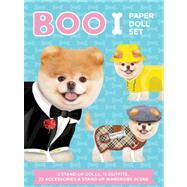 A paper doll set featuring a stand-up, die-cut doll of Boo, and a doll of his best friend, Buddy. There are 15 outfits and accompanying accessories. Outfits include a tuxedo, chef outfit, beachwear, PJs, clown suit, and more. There is also a display scene of Boo's wardrobe complete with a mylar mirror.